The Moistest Coffee Cake in the World. 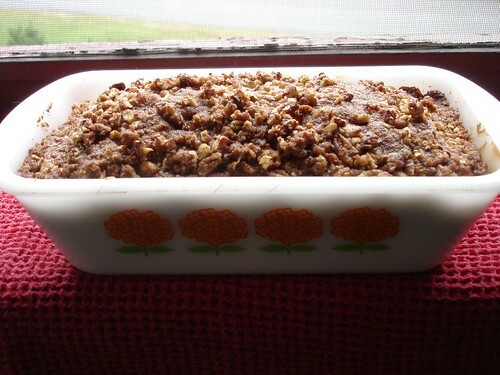 Posted byMandy	 September 9, 2008 1 Comment on The Moistest Coffee Cake in the World. It is a rainy day in good old Plattsburgh, the kind of day I just love. It is the sort of day where you curl up with a good book, a cup of tea, and a slice of coffee cake. 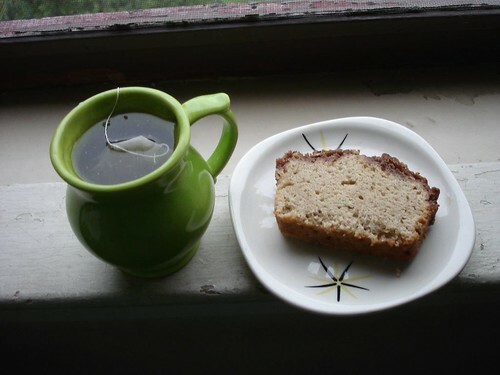 I have to work today, so there will be no books for me, but I did enjoy a slice of my delicious coffee cake with a cup of my favorite tea, Irish Breakfast. Pre heat your oven to 375 degrees. Mix melted butter or margarine, applesauce, rice milk, and vanilla together in a bowl. In another bowl, combine the dry ingredients. Next, add the dry ingredients to the wet mixture, mixing well. Pour the mixture into a well-greased pan and sprinkle with the crumbly topping. Bake at 375 for 30-40 minutes, depending on your oven size. Check the center with a toothpick after 25 minutes to see how well done the center is. If it comes out clean, you are all set. I have made this cake dozens of times since the original recipe was passed down to me. However, I have tweaked this cake so many times, it hardly looks like the recipe I was given so long ago. -Use organic oatmeal in place of the chopped nuts in the crumbly topping. -Use the same measure oil instead of butter or margarine while making the cake. Vegetable oil works well and a light olive oil also works. However, you have to use melted margarine while making the crumbly topping. -Mix a ½ cup of chopped nuts in the batter. -Halve the batter and sprinkle some of the crumbly topping between the two layers. Have a great day and keep cooking! The next time we meet, I will show you how to make a quick salad that uses up the massive basil crop from your garden! Basil, tomato, and mozzarella salad. Um, I’m in love with that green tea cup!